Home gardening is considered the nation’s most popular past-time. The National Gardening Association is widely recognized authority on the consumer lawn and garden market in the U.S. Since 1973, NGA has worked with the Gallup Organization to provide market research information for the lawn, garden, and nursery industries. In a survey released in March of 2004, eight out of ten U.S. households (78%) or 84 million households participated in one or more types of do-it-yourself indoor and outdoor lawn and garden activities in 2003. That is about the same number seen in 2002 and one of the highest levels of participation seen in the past 5 years. The National Gardening Association reports that consumers spent an average of $457 per household on their lawns and gardens in 2003. Over the past 5 years, average annual spending has averaged $465. As for the total U.S. lawn and garden retail sales, on average American consumers spent a total of $38.4 billion on their lawns and gardens in 2003. That was about the same level of spending seen the last three years. Over the 1999–2003 time frame total lawn and garden sales increased at a compound annual growth rate of 5%. From 1998–2003 lawn and garden sales increased from $30.2 billion in 1998 to $38.4 billion in 2003. In terms of demographics the most important consumers of lawn and garden products are men, people 45 and older, college graduates, households with no children at home, households in the Northeast, South and West, married households, 2-person households, and households with annual incomes over $75,000. 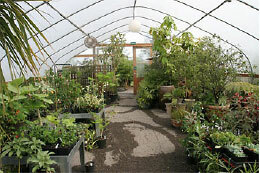 Retail gardener center owners often utilize low tech poly greenhouses for retailing plants. A full service independent garden center typically offers a much greater array of products as opposed to a mass merchandiser. Shoppers who frequent the discount and home improvement chains are generally shopping with an eye towards price as opposed to service, selection, and individual plant quality. Independents need to build their reputations on providing a full service environment with an extensive product line. While the independent can supply commonly used plants these need to be sold in much larger sizes. Higher prices can be used to attract shoppers as well. Larger plant material, offered in a larger selection of cultivars, will be a natural draw for the discriminating consumer. Choices appeal to shoppers looking for a product that unique. Choices appeal to a consumer’s love of individuality. 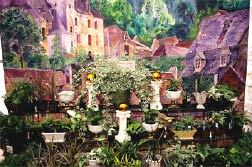 This high end garden center features hand painted murals on the interior walls to help set off the nearby plants. This Oregon garden center offers wide isles, a beautiful glass covering, excellent ventilation, and well displayed plant material. The proposed use will have no substantial adverse effect on abutting property or the permitted use. This publication is an excellent primer for the owner looking to establish a retail garden center. Northwest garden center owners have started to adopt the European concept of providing not only plants, but also a full line of clothing, casual furniture, pet supplies, tools, outdoor lighting, a full range of water features, as well as providing food and beverages. 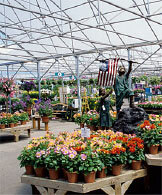 At the higher end garden centers 80% of the sales are to 20% of the customers. By providing a true shopping experience wise retailers can develop a niche market that can withstand the pressure of discounters. In fact some owners report that they like the presence of the chain store nearby as it increases the appeal of their higher end store.